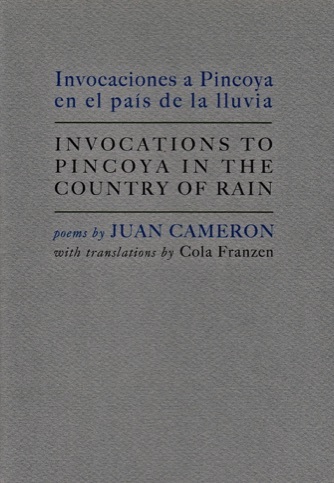 Invocaciones a Pincoya was written in 1983. The manuscript was lost, then rediscovered in 1992, & revised in 1993. This is its first English publication. The poems are addressed to Pincoya, a legendary mermaid, beautiful & alluring, who lives in & around the waters of Chiloé –forest Chile– a romantic landscape between the 42nd & 43rd parallels south of the equator, with virgin forests, huge lakes, many rivers, & heavy rainfall several months of the year. Juan Cameron was born in 1947 in Valparaíso, Chile. Members of his generation were just starting their literary careers when the Pinochet dictatorship began. To circumvent draconian censorship laws that forbade any criticism of the regime, they resorted to a coded language that could be understood by anyone familiar with the situation. A charismatic reader & an inspiration to the younger generation, Cameron used black humor & irony, with absolute devotion to the cause of poetry & freedom. Not belonging to any official group, he could not earn a living for his family, & after some years of struggle, emigrated to Sweden, where he lived for ten years. Now back in Valparaíso, he lives within earshot of the creaks of the cable cars, with his wife & collaborator, the graphic artist Virginia Vizcaíno. Cola Franzen has translated 22 books – poetry, fiction & scholarly work from Spain & Latin America, along with essays on art & photography. She regularly translates work by Argentinian-born Alicia Borinsky, & Antonio José Ponte, a Cuban now living in Spain. Her Poems of Arab Andalusia (City Lights 1989), still attracts readers, & recently, composers.